The Feeding of the Five Thousand – what can we say about it? Well, clearly, first, it was a miracle. In the first reading, the prophet Elisha fed a hundred people with twenty barley loaves and fresh grain. Christ supassed it by feeding five thousand men (as well as all the women and children) using just five barley loaves and two fish. But there’s more to it than just a feeding miracle. The words used, “Jesus took the loaves, gave thanks, and gave them out” remind us of the Eucharist, which Jesus will speak about later on in the chapter, which we will hear over the next few weeks. Given that the Eucharistic Congress Adoremus will be taking place in Livepool in September, it’s worth me saying a bit about the Eucharist. Firstly, we have the worry of Philip: what are we going to do? Two hundred denarii (and a denarius was the wage a labourer received each day) would only buy enough to give them a small piece each. Some troubles in life are far too big for us to deal with, and even vast amounts of money wouldn’t solve the problem. But a small boy brings his small gift of five barley loaves and two fish to the Lord, and then, they are enough. It’s a bit like the symbolism that takes place during the offertory. Bread and wine are brought up, and the wine is placed in the chalice. But what is added to the wine? A small drop of water. The wine represent’s Christ’s offering, His sacrifice on the Cross, whilst the water represents our small, weak, puny offering. In the offertory, it is joined to the wine, and together, they become the Blood of Christ at the Consecration. It ceases to be water and wine, and becomes Christ Himself, and His Sacrifice on the Cross is made present before us once again. 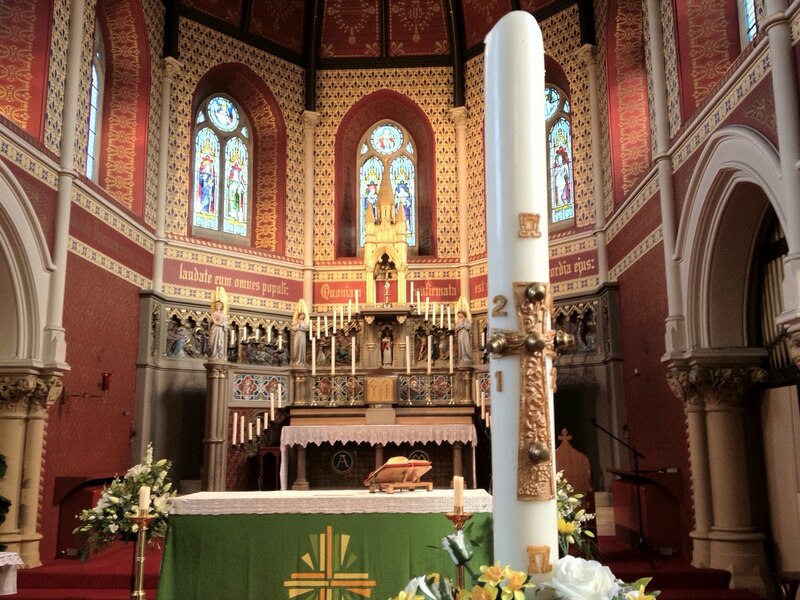 We are joined to Christ in the Mass, not just when we receive Communion, but during the Eucharistic Prayer, when Calvary is brought into the 28th/29th July 2018, at Sacred Heart, Hanley/Tunstall. We can’t go back in time to see Christ there, so He comes to us. And that’s why attendance at Mass is of so much benefit, even if we can’t receive Communion on this occasion. If I can just use a visual representation, Mel Gibson’s film The Passion of the Christ is Catholic through and through. At the point when Christ is being raised up on the Cross, it shows flashbacks to the first Mass, celebrated the day before in the Upper Room. Then, once the Cross is upright, one of the soldiers pulls away the rope, and a ring of metal falls down and makes a sound of metal striking metal. It’s a good reminder of the link between the Christ being raised up on the Cross, and the elevation at Mass, after the Consecration, when the bell is rung. Next time you see the film, look out for that detail. In the second reading, St Paul implores the Ephesians, and therefore us as well, to “lead a life worthy of your vocation”. When he says “vocation”, he’s not just referring to priests and relgious. We all have a vocation, as baptised people, to serve the Lord. He implores the Ephesians, and us, to overcome the divisions between us, and to be bound together in the charity of Christ as the Body of Christ. And this is what the Eucharist does. The sacrifice of Christ has the power to draw us into greater unity and to begin to conquer our faults and to grow in holiness. After the crowds had eaten the multiplied bread and fish, we find another important lesson. Jesus doesn’t just allow the food to be left behind and go mouldy. He says, “Pick up the pieces left over, so that nothing gets wasted”. On one level, you could say that this reminds us that at the end of communion, the remaining sacred hosts are placed in the tabernacle. Given that the Eucharist is Christ, not just blessed bread, the hosts have to be placed somewhere secure, and never thrown away. If a host falls on the floor, it has to be consumed. If something were to happen to a host so that it couldn’t be consumed, then it would have to be left to dissolve in water, and then, once it had dissolved, the remains would then be poured down into the earth. Each host, and parts of a host that might break off, have to be treated with the utmost reverence, and it also means that if, for example in hospital, someone is given only a small sliver off a host for medical reasons, the person still receives the whole of Christ. But there are other dimensions here too, because the action of gathering together the remaining bread and fish reminds us that the Eucharist commits us to care for the poor. You may have plenty – but don’t waste it. Give of your excess to those who are hungry. Lastly, the people saw the sign Jesus had given – and misinterpreted who He is and why He had come. We get things wrong – and we need to keep coming back to God, hear His Word, and find out what it is we are supposed to be doing. No-one is perfect, but with each Mass we attend we can make some progress, even if it is two steps forward and one step back. So, end of part one – and next week we will unpack other dimensions of the Eucharist, as we continue our journey through John chapter six.